On Monday and Tuesday we will create a foldable for SOIL! One of our most important natural resources! On Friday, weather permitting, we will go outside and record our observations of weathering and erosion happening right here at Lone Star! Turn your notebook sideways, and create a t-chart with the left side for "mechanical weathering" and the right for "chemical weathering". When outside, record at least five examples of each type of weathering that you can observe. For mechanical weathering, look for animal actions, plant growth, abrasion, ice wedging, and pressure release. For chemical weathering, look for animal/plant actions, oxidation (rust), CO2 reactions, water reactions, and acid rain. If you need to make up this assignment, you can do it at home or any location where weathering and erosion occur . . . which is everywhere! Watch the following videos in class on Thursday (or at home) and take notes in your class notebook by finding a total of 10 interesting and important facts about weathering and erosion. Take notes on weathering in your notebook. You may use the cloze notes (fill-in-the-blank notes) attached below. Skim, then read, pages 38-45 in your textbook, and then follow the directions on the worksheet carefully. Create flash cards for the vocabulary words listed on the attached worksheet. If you do not have index cards to use, you may create a vocabulary list in your notebook instead. If you finish this assignment before Wednesday, you should start on the reading assignment for section 2.1 "Rocks & Weathering". On Monday, April 20, we will take our 2nd quiz on Rocks & Minerals. Please study your foldable, your notes, your flashcards, and the study guide to prepare. If you are not happy with your score, you may retake the quiz before the Firm Deadline if all of your classwork is completed. On Wednesday we will learn about Rare Earth Elements, important substances for electronics and other hi-tech industries. We will watch a segment from the CBS news show 60 Minutes, and also discuss the topic in class. Complete the cloze notes and answer the questions attached below. Here is the link to the 60 Minutes segment on Rare Earth Elements on the CBS website (higher quality). A YouTube version is also attached below (lower quality). 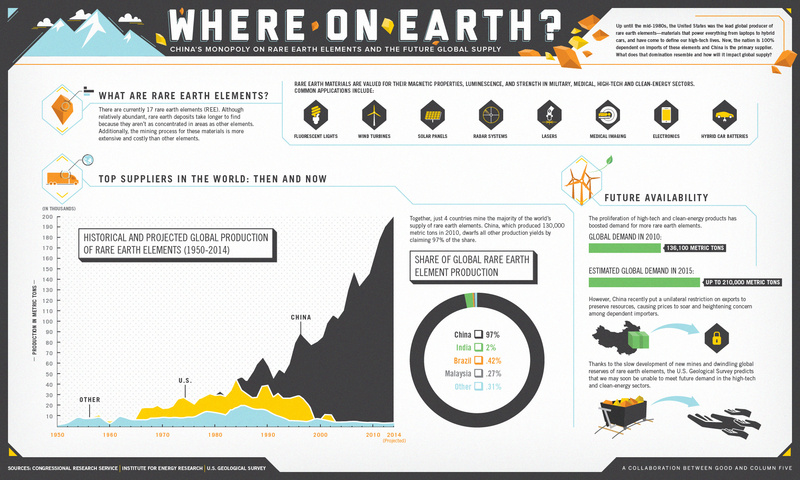 And here is a link to an awesome infographic on Rare Earth Elements. Finally, below the 60 Minutes video are two more YouTube videos on the topic. These are optional to watch, but recommended. Complete the optional crossword puzzle for 5 points towards your grade. Due Friday, April 17.